Louise Krasniewicz teaches anthropology classes on zombies, steampunk, science fiction and comic books. As a self-proclaimed geek anthropologist working out of the University of Pennsylvania, we sat down over coffee to swap theories about monsters, the feminization of geek culture and the current state of anthropology. I first became aware of the coming ‘ontological turn’ in relation to the Manchester debate on whether ‘ontology is just another word for culture‘. My objection to ontologies are summed up in that one proposal. Since then we’ve apparently taken an ontological turn following a debate of that name at the 2013 AAA in Chicago. If the debate is really new to you, in a nut-shell ontology is the philosophy of being and becoming: the existential (but not existentialist) wing of philosophy. As it spreads through anthropology its architects have bilt upon Viveros de Castro’s Amazonian perspectivism which suggests many Amazonians possess such radical alterity, (otherness) through their animistic cosmology (understanding of the universe), as to account for an entirely different ontological reality. For ontologists this is beyond epistemology (the theory of knowledge) as it is about being – not knowing. That Amazonian animists recognise some animals and objects as persons and the ability of these multiple persons to transform across these categories leads to an appreciation of the associated shifts in perception that would accompany such shifts. This is not just a difference in beliefs, knowledge or taxa – this is a difference in their being. Once we recognise the separate way of being in one group the floodgates are open. Multiple ontologies are here. Recently two blogs – one by the Proctontologist and another an anonymous reader at Savage Minds – dared to be among the first to poke at the ontology bubble. The former has me laughing out loud regularly. I admit to being a fan since an epic rant against ‘the Cambridge clique’ on the Anthropology Matters email list back in 2012 (clearly the same person -surely). Yes – he is mean and rude to friends, colleagues and acquaintances of mine, including at least one who scores a solid 10/10 on any scale by which loveliness can be measured. But I have a juvenile sense of humour (I thought I’d grow out of it upon becoming a dad – turns out 1000+ nappy changes doesn’t stop poo being funny – who knew?) and he has an eye for the ludicrousness that seeps through much of this writing. The second writer (the one on Savage Minds) got me thinking. The two first critiques I’d read sicne the AAA – two anonymous authors. The proctontologist’s anonymity is in a large part troll-armour. The anonymous letter on the other hand seems like something sadder. At post-faculty seminar drinking sessions we are many – it’s time for anti-ontologists to start to share our general sense of ‘meh‘ with the world. It’s culture. It was there from the beginning for me. I understand that culture is a loaded term – but taking it to be fluid, contested, social constructed – it’s the analytical category that stands for the short hand for the stuff of anthropology. Yes – Amazonian perspectivism is more than belief – there are practices and material things woven into these webs – but ontologists don’t add anything to my understanding. If anything it introduces an intangible black box at the heart of some people and cultures with claims made that these things are unknowable for outsiders. If it’s not culture it’s habitus or doxa or some other synonym we use to avoid the word culture. It’s culture. Meh. Social change – yes there is talk of transformation, vectors and becoming – but ontologies are clearly more frequently deployed to illustrate deep-lying differences of the ‘they do X’ variety. Doesn’t sit right for me. They are X. There’s an awful lot of ‘they’ in ontological writing. Too much homogenisation for my liking. Hard to talk about the collective being of a group of people without homogenising. Puppetry (critique nicked from Andrew Irving). Ontolgists are projecting philosophically nuanced ideas onto other people(s) to make them dance for anthropologists to have a conversation about anthropology. This is not about our informants – it’s about us. Meh. Having said all this – I am fully prepared to be convinced. I could be wrong. It just seems to me that every time this debate starts up down the pub we get further and further away from anthropology and further into philosophy. Yes it might frame a debate about understanding differences very well – but unless it helps me understand those differences (and similarities) then I’m not going to jump on board. (Video presentations from Patrick Alexander – ‘Dare’; Samantha Bennett – ‘Fan It’, Julie Jenkins – ‘Africa’; & Stephen Van Wolputte – ‘Indaba’). It’s finally happened. I’ve now read certain children’s books so many times that I’m starting to internalise them. First it was Alison Jay’s excellent I Took the Moon for a Walk. Now it’s The Gruffalo. With an 11 month old I rarely get all the way through before the book is picked up and chewed, he starts to turn the pages back towards the beginning, or he just gets up and leaves. But what strikes me most about the book when I do make it all the way through is the beautiful symmetry to it. The first line is echoed in the last. The three meetings (with the fox, the owl and the snake) are played out in reverse order in the second half. It all tilts around the mid-point meeting with the Grufallo. It is so well structured it is a thing of beauty. Now I can’t help but feeling that this echoes something familiar as an anthropologist. The ingredients of story – the symmetry and structure – make little Levi-Straussian bells go ding-a-ling in my head. The symmetry, while perhaps stripped down (it is for kids) echoes Levi-Strauss‘ analysis of the trickster myth. The little mouse being a Prometheus character. The story is in essence about a mouse who uses cunning to overcome three animals and a Grufallo who all want to eat him. So on the way to the apex of the story he is fearful of being eaten and must use his story-telling cunning to convince the fox, owl and snake that he himself is to be feared and therefore not eaten. The story-telling device he uses is to invent a horrid monster – the Grufallo. The twist then comes that when he gets past the three carnivorous animals he discovers the Grufallo really exists. He then walks back through the forest with the fear of each of the animals he’d passed earlier confirming his fearfulness to the Grufallo. 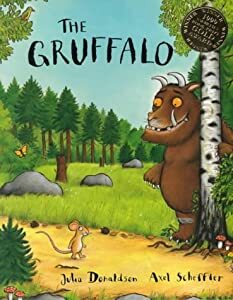 His declaration that his favourite food is’ Grufallo crumble’ echoes earlier threats to the animals that the Grufallo’s favourite food is ‘roasted fox’, ‘owl ice cream’ and ‘scrambled snake’. It is also the final straw that sees the Grufallo flea in fear and the mouse left free to enjoy eating a nut. 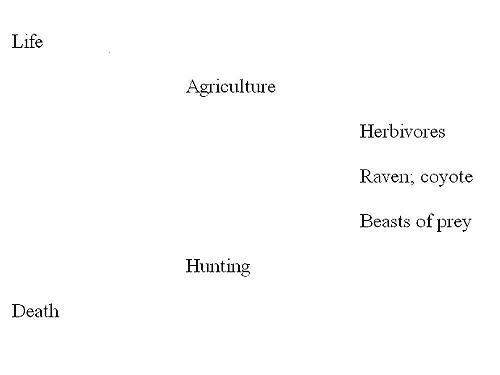 So what we have here is the Levi-Straussian binaries of feared: fearful, prey: hunter, herbivore: carnivore, and reality: make-believe. The story is one of transformation through storytelling. As Edmund Leach notes of Levi-Strauss’ structuralism – it’s best to visualise these binaries in regards to triadic relationship – the transformative process being the third side to the triangle. Through storytelling the mouse is transformed from prey into hunter, from herbivore to carnivore, from the fearful to the feared. He is the trickster – achieving all of this through his wit and storytelling ability. But in trickster myths regarding fire, the pivot of transformation occurs when fire is stolen. Here, rather than it being fire, the power the mouse acquires seems to be the ability to construct reality through story. The Grufallo is brought into existence through his story-telling. While often there is a punishment received by the trickster in such myths – this is a lovely gentle children’s story. Here the mouse defeats the Grufallo. His reward – a return to his natural state as herbivorous – but in a new life without fear. I may have over-thought this.